When researching vintage designer stuff, it’s good to have some resources to compare labels and signatures to help you date and compare. An even better thing would be to share these resources. Today I’ve got some examples of vintage Burberrys’ labels to look at. 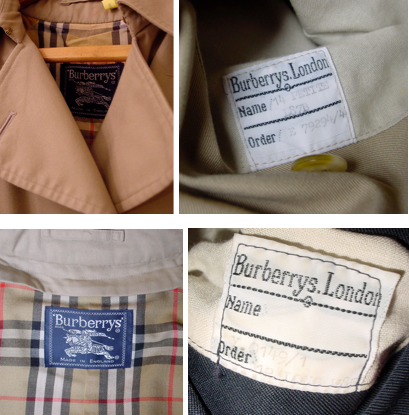 Thomas Burberry started his clothing manufacturer in 1856. In 1880, he created a wateproof and windproof fabric that he named gabardine which he used to make raincoats. The raincoats were so hardy that they were adopted by British military personnel in WWI, hence the name trench coat. The Burberrys’ logo is pretty easy to track. The “Knight” logo was first used in 1901. The signature beige and red “Nova Check” was adopted in 1920. 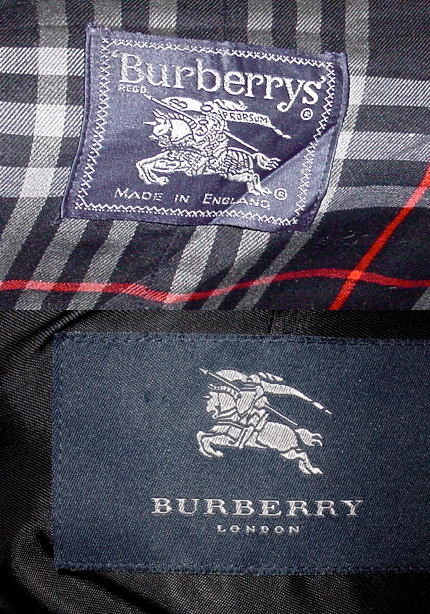 In 1999, Burberrys’ changed its name to Burberry (see bottom picture below). And most trenchcoats have a label sewn into the pocket with size and an number that contains the year the coat was ordered. For example, the labels above are for 1979 and 1985. Useful, thanks – I’m trying to date just this kind of coat! Sorry, I can’t help you out on pricing. Usually the best way to get an idea of valuations is to search completed listings on ebay.